Cafe owner Frankie has been unlucky in love all her life. It’s hard in a small town like Bunyip Bay to meet prospective partners. Her sister, Simone, lost the love of her live years before and is now devoted to raising their two teenage girls, leaving little time for romance. When Frankie is kissed by a handsome stranger who calls her Simone, it’s a case of mistaken identity – but who is this man and how does he know Simone? Reclusive farmer Angus wants nothing to do with Logan’s plans for improving the property’s finances and finding a partner – until he meets the sisters at a wedding. Who is attracted to whom? More importantly, can Frankie and Simone sort out their feelings for the two brothers without destroying their very close bond. 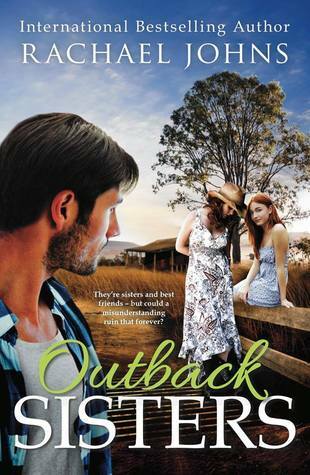 Outback Sisters – was all that I love in a good romance novel. Add to that a good rural Australian romance. There were plenty of little twists and turns, much drama and heartache, and of course love. If that wasn’t enough, I was also reminded of good times, when Rachael Johns mentioned The Magic Faraway Tree (Enid Blyton) which took me off in a little indulgent reminiscence. She also has two characters who love reading – Logan and Frankie, and their book talk was also a little icing on the cake. Actually these two were very good at putting icing on cakes! Two sisters, two brothers and wires crossed. What fun! Well it did cause them some consternation and setbacks but…in the end perfection! It all started when Simone’s two girls Harriet and Grace sign up to a social media dating website as their mother (unknown to her)… and Logan comes calling. Each book in this Bunyip Bay series has been stellar. This one – #4 was every bit as good as the others and I thoroughly enjoyed it. While it is part of a series you could read it as a stand alone, but this whole series is too good to miss out on. Previous postThe Butterfly Summer. Harriet Evans. Next post2016 Bookish Resolutions – February Look Back. Oh, I love books set in the Outback…I haven't read that many, but I am eager to read more.